From roof repair to installing new siding, as a new homeowner, you’re constantly looking for home improvements with a high return on investment. There are many home improvement projects that are high on ROI; one of these home improvement projects is replacing your current door with a steel entry door. In this article, Homecraft Inc discusses why steel doors have the highest return on investment. Getting your trusted roofers to improve your home’s resale value is great but steel doors can also reinforce your home’s property values by a significant amount. When reselling, people are actually getting back more than what they spent on the door, hanks to the boost in curb appeal steel entry doors provide. In addition, you improve your home’s look but also enhance its energy efficiency compared to old exterior doors. This is because steel entry doors are filled with foam to maximize insulation and are constructed with thermal adhesives to increase structural integrity. Steel entry doors do not warp or rot, which makes them lower maintenance than other doors. These doors are designed to take a beating and don’t require as much repainting and repair as a wooden door. Steel entry doors are superior in the durability department since they don’t warp or crack. This durability allows the doors to withstand extreme temper, such as heavy rain, strong winds and snow. With the steel entry door’s durability, it’s a guarantee that it can help with security as well. Most steel doors have a solid strike plate and 3-inch long mounting screws, greatly increasing the door’s security. 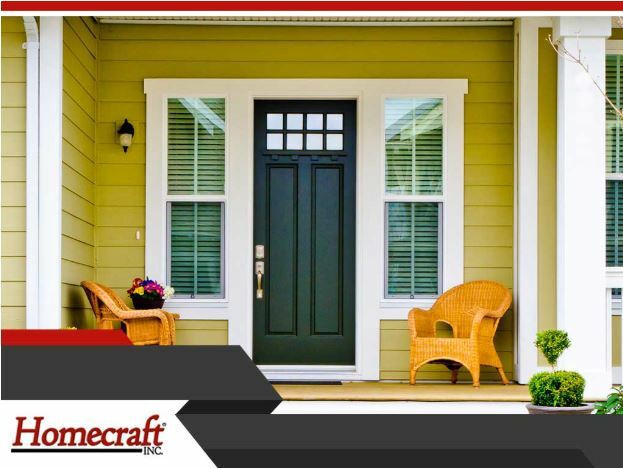 If you have any plans of home remodeling this spring, turn to Homecraft Inc. for your home improvement needs. We are your leading provider of roofing and door installation services. Give us a call at (877) 494-0377 or fill out our contact form to request a quote. We serve homeowners in Newark, Middletown and Bear, DE and other nearby areas.